Volunteers contribute their unique talents, skills and knowledge to staff and library members, connecting people and building our community. 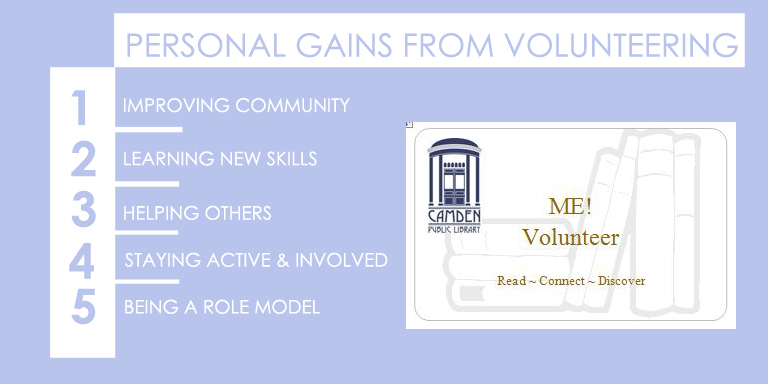 The caring power of our volunteers improves lives by making Camden Public Library even better. As a volunteer, you can help with many meaningful tasks, take on a time commitment of your choice and feel an immediate sense of pride in your work. 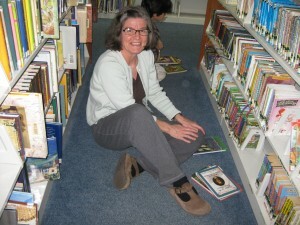 Over the years, we have seen how essential volunteer support is to library operation and the impact volunteers’ efforts have on our ability to serve our community. Read on about Volunteer Opportunities, FAQ and JOIN US! a. Adopt-A-Shelf: Whether by accident or lack of attention, books get out of order – it happens all the time. Everyone has probably experienced a moment of frustration of looking up a title in the catalog, only to walk over to the shelf and find that it’s not physically there. Adopting a Shelf is an easy solution! It takes just a minute or two to look at a shelf and recognize which titles are out of order and to place the travelers back in their right spots. Correct shelf order makes items easier to find within the shelf, it ensures that books are not marked as “missing”, and it puts a smile on the faces off library users and staff. d. Homebound Delivery: Every week or two, a volunteer picks up a box of books and delivers it to a library member who is unable to come to the library. Applicant must be 18 or older. e. Clerical support: This category include miscellaneous clerical tasks that vary throughout the year. If you are interested or have specific skills, please inquire! 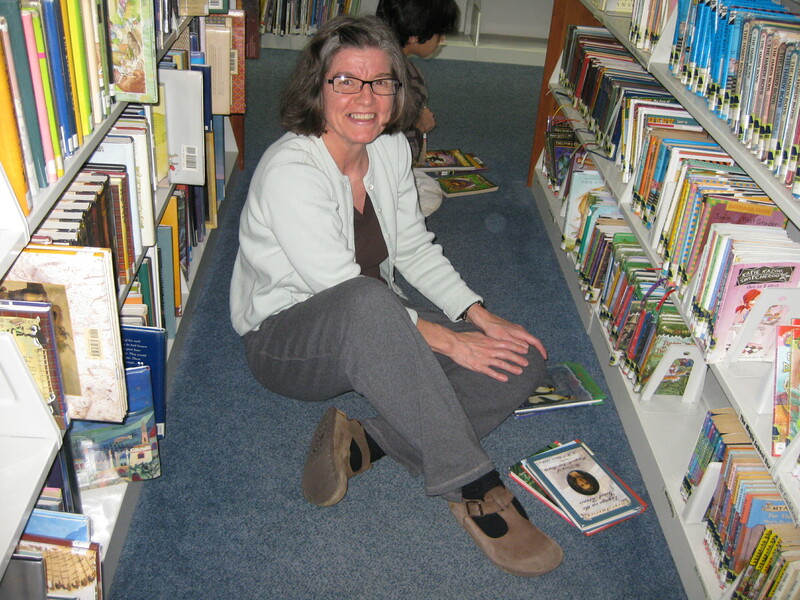 An example is a volunteer who peruses local newspapers, clips and preserves articles about the library. f. Book repair: Books receive quite a bit of wear and tear when they are circulating. We are continuously repairing bindings to prolong the life of books. This task is done primarily sitting at a desk and is a great team activity. g. Helping new computer users – one-on-one by appointment. h. Tax help: one-on-one by appointment. We prefer shifts in 1 hour blocks as well as a day of the week commitment. Shorter and summer only opportunities are available, as are project based opportunities. Can I work different days each week? Some tasks, such as shelving and Adopt-a-Shelf may be performed on different days. Others, such as homebound delivery, require a commitment for the same day of the week, especially when working as part of a team. We welcome volunteers as young as 8, with adult supervision up to 12 years of age. Can I complete service hours for school/community service? Yes. Please contact us directly at 236-3440. Coming soon – high school internship opportunity!